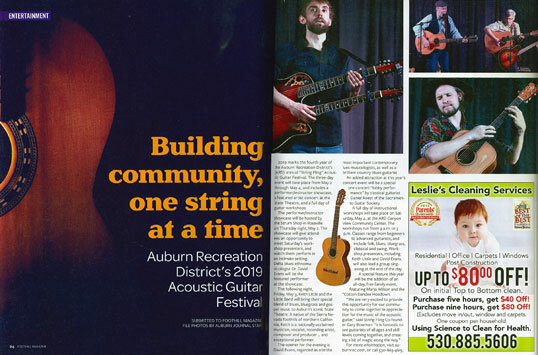 This year marks fourth year of the Auburn Recreation District’s (ARD) annual Acoustic Guitar Festival, STRING FLING. 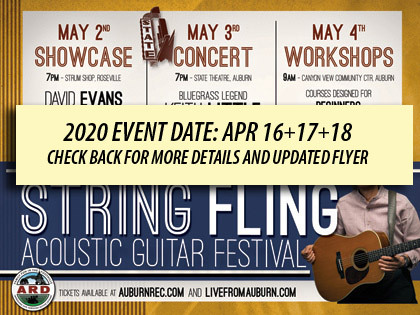 The three-day event will take place from Thursday, May 2nd through Saturday, May 4th, and includes a performer/instructor showcase, a featured artist concert at the State Theatre, and a full day of guitar workshops. The performer/instructor SHOWCASE will be hosted by the Strum Shop in Roseville (The Strum Shop - Ukuleles, Guitars and More) on Thursday night, May 2nd. The showcase will give attendees an opportunity to meet Saturday’s workshop presenters, and watch them perform in an intimate setting. 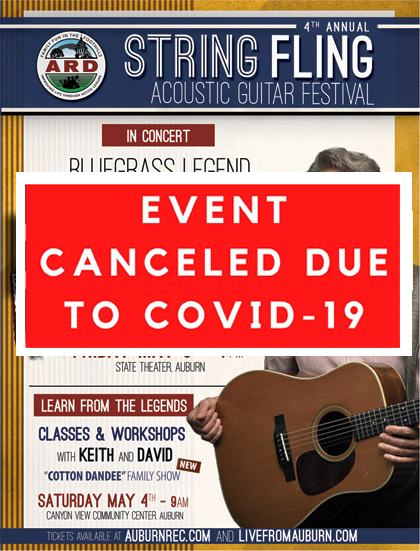 Delta blues ethnomusicologist Dr. David Evans (Dr. David Evans) will be the featured performer at the showcase. (Strum Shop - 209 Vernon St, Roseville, CA). The following night, Friday, May 3rd, Keith Little and the Little Band (LittleBand) will bring their special blend of blues, bluegrass and gospel music to a CONCERT at Auburn’s iconic State Theatre. A native of the Sierra Nevada foothills of northern California, Keith is a nationally-acclaimed musician, vocalist, recording artist, composer, and producer…and exceptional performer. The opener for the evening is David Evans, regarded as one the most important contemporary blues musicologists, as well as a brilliant country blues guitarist. 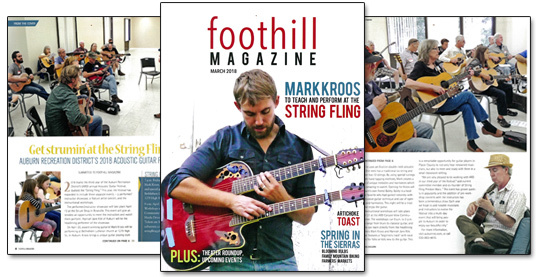 An added attraction at this year’s concert event will be a special pre-concert ‘lobby performance’ by classical guitarist Daniel Roest of the Sacramento Guitar Society. A full day of instructional WORKSHOPS will take place on Saturday, May 4th at the ARD Canyon View Community Center. The workshops run from 9 a.m. to 3 p.m. Classes range from beginners to advanced guitarists, and include folk, blues, bluegrass, classical and swing. Workshop presenters, including Keith Little and David Evans, will also lead a group sing-along at the end of the day. 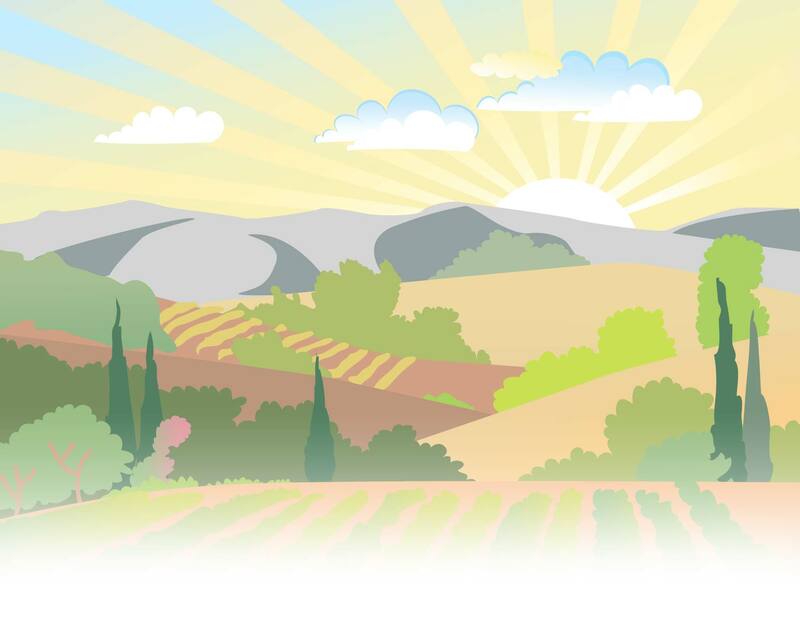 See instructors bios and course descriptions. Workshops are offered four times during the day. Outdoor spaces will be set aside for small groups to jam. A guitar and equipment will be raffled off. Lunch is provided with your pre-registration. ONLINE REGISTRATION ENDS AT 5PM ON 5/1/19. TICKETS WILL BE AVAILABLE AT THE DOOR FOR BOTH THE FRIDAY CONCERT AND SATURDAY WORKSHOPS.